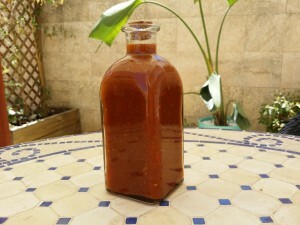 One of my favourite West Indian hot pepper sauce recipes. There are hundreds or hot chili sauce recipes on the internet. This one was created with the help of my son who it would seem is a serious Pepper Head. There was much trial and error, but this version turned out to be the one we love the most. Firstly, you are going to need good chilies and my early attempts were made with locally grown Spanish Habaneros. They are seriously hot, but when I tried to buy more the only available chilies were the Bird’s eye sometimes known as Thai Chili, which is the basis of this recipe. We now have young Carolina Reapers, Trinidad Scorpions and Nagra Ghosts growing in the garden so the next recipe could be hotter again. However, the most important thing is to produce a well balanced, good tasting sauce and this is what I hope to share with you below. 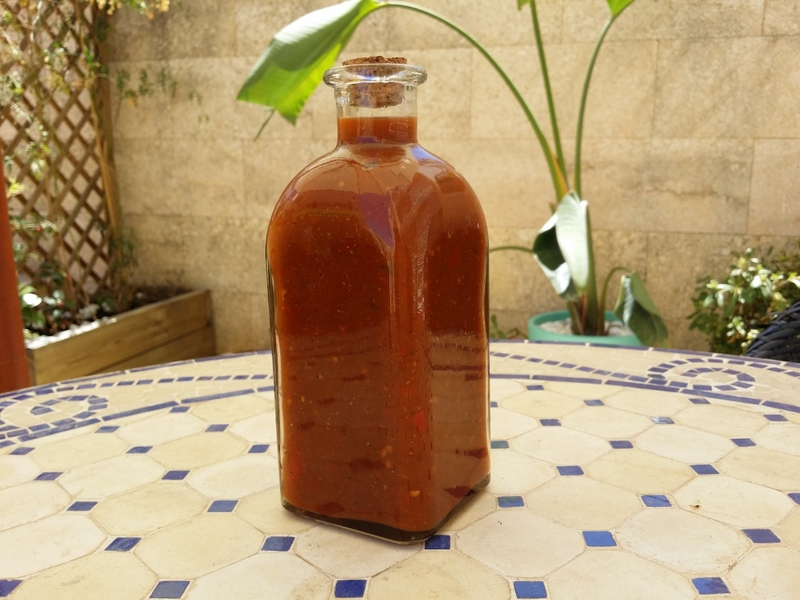 You don’t need super hot chilies to make a good hot sauce, but I can’t emphasise enough that quality fresh ingredients are the key to avoiding disappointment. You would think that it would be easy to buy hot chilies in Spain but Spanish people are not accustomed to spicy food. I am pretty certain that our local veg store only keeps them in for us. When I see them, I buy. The only problem is that they can be expensive and whilst Spain has a climate in which chilies can be easily grown, they are seasonal and often have to be imported from Africa or Peru. Early version with Spanish Habaneros chilies cooking on the hob. Firstly, a couple of recommendations. 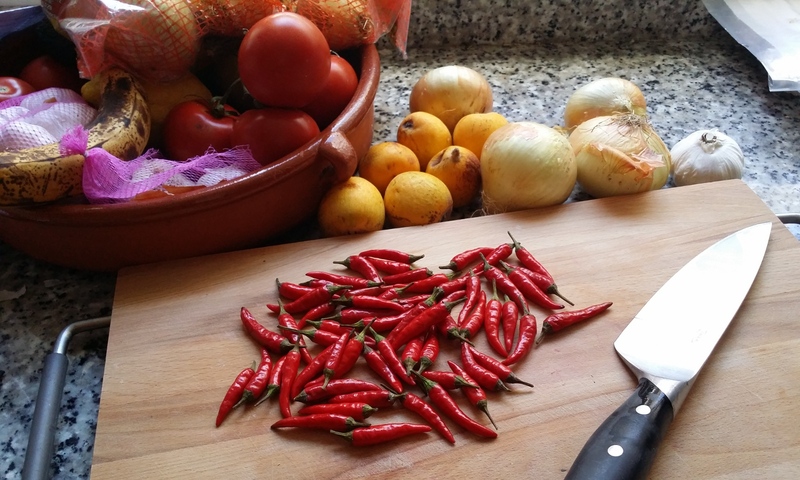 Preparation is everything when you are working with hot peppers. 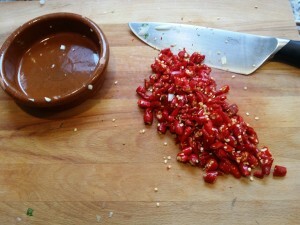 If you are cooking raw chilies you should wear gloves at all stages of the preparation. Keep your fingers away from your eyes, otherwise you will be engulfed in tiny circles of fiery pain. This is especially important if working with some of the hotter variates. Fill a sink full of hot soapy water and when you are finished with cooking implements drop them straight into the sink. When blending up the final ingredients wear eye protection. The mixture can be quite pungent when cooking, so a well ventilated kitchen is essential. 1 medium ripe mango or (3 Nispero if available) skinned and chopped. If using Nispero do NOT include the seeds. This will help balance some of the acidity of the vinegar as will the tomatoes. 4 tbs of coarse cooking salt. Add the onion, garlic and the cumin seeds together with a little pepper and salt into a deep pan that has a lid..
Once the ingredients are frying gently add the lime juice and remaining ground pepper. Stir in well. Now de-stalk and coarsely chop all the chilies and add them to the pan including the seeds. 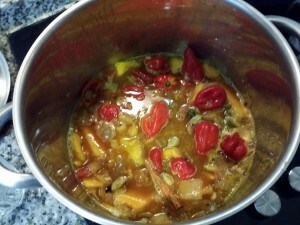 Stir the chilies in and then add in half of the remaining wine vinegar. Increase the heat but don’t allow to boil. After a few minutes further heating on a moderate flame add the mango, tinned tomatoes and the rest of the wine vinegar. Add the mustard seeds and finely chopped coriander / cilantro leaves. Bring the pan up to simmer for about 5 minutes. Finally drop the heat to a very low simmer and place the lid on the pan. Slow cook the mixture for 1 hour. Leave to cool before blending with a hand-held blender. De-cant the mixture into oven sterilized glass bottles. The slow cooking of the onions can make the mixture quite thick. If the mixture is too stiff add a little more vinegar. Add a little more salt if needed.